There have been a significant number of new empirical, academic studies on the subject of cigarette smuggling that have been published in different scholarly journals and by think tanks, government agencies and others over the last several years. These papers almost universally recognize that a significant amount of cigarette smuggling takes place in North America, though estimates differ due in large part to methodology, time periods of study and data availability. The following section briefly describes these studies and their findings. [*] They appear in reverse chronological order. “Understanding the U.S. Illicit Tobacco Market: Characteristics, Policy Context, and Lessons from International Experiences” is a large study published by the National Research Council and Institute of Medicine in 2015. The report estimates that America’s illicit cigarette market ranges between 8.5 percent of “consumption subject to tax avoidance and evasion” and 21 percent of the total. The lower bound is a calculation made by the authors, while the higher bound comes from “plausible estimates” of another research paper that we describe in more detail below. Also published in 2015 was a paper titled “Reservation Prices: An Economic Analysis of Cigarette Purchases on Indian Reservations.” The paper was not designed to measure smuggling rates per se but rather the “economic incidence of the tax break” provided on cigarette purchases on Indian reservations. The authors also try to assess whether or not that tax break increased or decreased consumers’ demand for lower quality cigarettes. It did, however, provided insight into one component of New York State’s overall smuggling rate. The dataset used in the study runs from 2003 through 2009 and comes from the New York State Adult Tobacco Survey, conducted by the New York State Department of Health. The authors used 6,539 current smokers in their sample. Some 19 percent said that they always purchase their cigarettes on reservations, a form of casual smuggling. Several government agencies in other states have attempted to estimate cigarette smuggling rates in recent years. The State of California’s Board of Equalization concludes in “Revenue Estimate: Cigarette and Tobacco Products Tax Evasion” that 16 percent of the cigarettes consumed in the Golden State in 2013 were not taxed. The figures are estimated based on a unique statistical model created for this paper that was published in 2014. Also in 2014, the Wisconsin Department of Revenue sought answers to similar questions studied by the California Board of Equalization. They published “Study of Wisconsin’s Cigarette Tax Collection System,” which forecasts a tax evasion rate of between 5.8 percent and 7.7 percent in Wisconsin for 2015. The “cigarette tax gap” estimates used in the study calculated the difference between actual consumption and excise tax revenue and what excise tax revenue should be based on per-capita adult smoking rates. The difference in revenues represents the level of tax evasion. 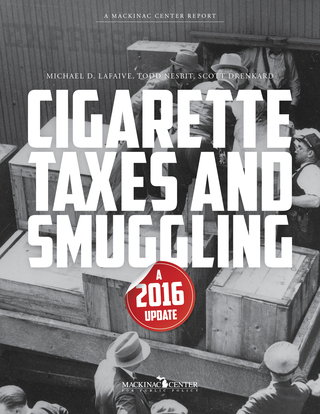 The Department of Revenue in Washington state also published a paper on this topic in 2014, titled “Cigarette Tax Evasion Estimate - FY 2013.” The estimated smuggling rate is pegged at nearly one third of the entire cigarette market — both legal and illegal sales. The estimate is derived by comparing per-capita cigarette consumption with per-capita sales of cigarettes. The estimate excludes, rather than controls for, the possible contributions of smuggled, but legally untaxed, cigarettes from Indian reservations in the state. Two studies were published in 2014 that looked at the cigarette smuggling rates in Ontario, Canada. The Ontario Convenience Stores Association contracted with NIRIC, a business research consultancy, and published “OCSA Contraband Tobacco Ontario Study September & October 2014.” It was an analysis of discarded cigarette butts from 130 locations throughout Ontario. Some of discarded butts were of foreign or Native American origin and others were unbranded. On average, they estimated that 22.5 percent of all discarded cigarette packs across these locations were contraband. The National Coalition Against Contraband Tobacco also conducted a survey of adult smokers in Ontario from October 2013 to July 2014. This online survey found that between 22 percent and 42 percent of cigarette products purchased by respondents were illicit. Tobacco Control also published “Cigarette Trafficking in Five Northeastern US Cities” in 2013. The authors of the study collected and examined discarded cigarette packages in Boston, New York City, Philadelphia, Providence, Rhode Island and the District of Columbia. By looking at each package, the researchers identified tax stamps which should identify the location from which the cigarettes originated. They determined that 58.7 percent of the 1,439 littered cigarette packs they collected did not have a proper local tax stamp and between 30.5 and 42.1 percent could be attributed to illegal trafficking. The authors also estimate that these cities lose between $680 million and $729 million in combined tax revenue as a result of this smuggling. Of the city-specific numbers generated by the authors’ research, two stand out. More than 75 percent of the discarded packs with a nonlocal stamp collected in Providence came from Massachusetts. Massachusetts itself maintains a tax rate of $2.51 per pack, but Rhode Island’s rate is even higher at $3.75 per pack. Of those collected in the District of Columbia, 50 percent originated in Virginia and 32 percent in Maryland. Another city-specific analysis was published in Tobacco Control in 2013. The article, titled “The Illegal Cigarette Market in a Socioeconomically Deprived Inner-City Area: The Case of the South Bronx,” describes the results of a discarded cigarette pack analysis. Researchers found that “76.2 percent of cigarette packs collected avoided the combined New York City and State tax.” Almost 58 percent were not taxed at all. The authors’ conclusion was that poor areas of the U.S. may have higher tax evasion and avoidance rates than elsewhere in the country. Andrew Chang & Company, LLC wrote “The State and Local Impact of Tobacco Prices on Smuggling and Black Market Tobacco Sales” for the California Foundation for Commerce & Education and released it in September 2013. This report focused on California and used data from 2001 through 2010. The authors pegged California’s 2010 smuggling rate at almost 19 percent of the total market. Their conclusion is based on a residual model, comparing the difference between taxed legal sales and an estimate of consumption. In 2012, the business consultancy John Dunham and Associates released “An Examination of Cigarette Sales in New York State by Source: 2011” for the New York Association of Convenience Stores. The report concludes that 52 percent of cigarettes in the Empire State came from “alternative sources including lower taxed states, Native American reservations, military sales or duty free sales.” This figure does not include cigarettes that were smuggled into the state from international sources. The National Tax Journal published a paper in 2011 that looked at cigarette tax evasion rates in New York City. The authors of the article, titled “Using Littered Pack Data to Estimate Cigarette Tax Avoidance in New York City,” collected discarded packs in 30 city census tracts before a 2008 state excise tax increase of $1.25 and then three times afterward. They found that 15 percent of discarded packs had no tax stamp before the state excise tax took effect, but that number leapt to 24 percent afterward. A 2010 National Bureau of Economic Research working paper called “Excise Tax Avoidance: The Case of State Cigarette Taxes” uses data from two supplements to the U.S. Current Population Survey in 2003 and 2006-2007 that asked participants about tobacco use and tax avoidance. The researchers used these results to estimate cross-border purchasing rates for cigarette consumers in each state, with Vermont and the District of Columbia topping the table at 18.7 percent and 18.5 percent, respectively. Florida, Hawaii, Kentucky, Mississippi, Missouri, Nevada, North Dakota, and South Carolina all had cross-border purchasing rates of less than 1 percent and New York state’s rate was only 4.1 percent. “Cigarette Tax Evasion in Minnesota” was prepared by economist Marsha Blumenthal in 2009 for the Minnesota Department of Revenue. It reported several conceivable statewide smuggling rates based on survey research and estimated a 2 percent to 8 percent smuggling rate in Minnesota based on tax gaps between what should have been collected in excise tax revenue and what was actually collected. Another study published in 2009 discusses the global impact of the illegal market in cigarettes around the world and concludes that “if the global illicit trade were eliminated, governments would gain at least $31 billion in additional tax revenue, and from 2030 onwards, would save over 160,000 lives a year.” The report ranks the United States as the third highest in the world in 2007 for the illicit trade in cigarettes, behind Russia and China. An award-winning study in 2008 estimated that between 13 percent and 25 percent of consumers nationwide purchase their cigarettes in “border localities,” such as over a state border or on an American Indian reservation. The datasets used for this paper end in 2002 and rely on consumers who live in Metropolitan Statistical Areas rather than entire states. “How Far to the Border: The Extent and Impact of Cross-Border Casual Cigarette Smuggling” was selected for the Richard Musgrave Prize by the National Tax Association for “authors of outstanding new contributions in the field” of public finance. A 2008 study also tried to measure the impact of casual smuggling nationwide. “Crossing the Line: Direct Estimation of Cross-Border Cigarette Sales and the Effect on Tax Revenue” estimates the degree to which consumers smuggle cigarettes for personal consumption. They conclude that “an individual is willing to travel 3 miles to save one dollar on a pack of cigarettes,” but that nationwide the casual smuggling rate for consumers is only 4 percent. “Washington State Cigarette Consumption Revisited” employs an econometric model using eight years of data, from 1997 to 2004. Published in 2007, the authors find that Washington’s average smuggling rate — or nontaxed sales — was 14.9 percent. They provided estimates for all 50 states and the District of Columbia and found Massachusetts to have the highest smuggling rate of 17 percent. The U.S. average rate was 1.7 percent. An oft-cited paper by economist Mark Stehr, “Cigarette Tax Avoidance and Evasion,” estimates that between 68 percent and 85 percent of changes to legal paid sales may be explained by tax avoidance and evasion. [††] Stehr also estimated that, of the states in his analysis, some 12.7 percent of cigarettes were being purchased without payment of state taxes by 2001. Finally, a 2005 paper examines 2001 survey data taken from 3,602 smokers in the United States and determined that 34 percent of respondents “regularly purchase from a low or untaxed venue.” A “venue” could mean an Indian reservation or other state or country. Of the 214 respondents surveyed from Binghamton/Johnson City, New York, 66 percent reported purchasing lower priced smokes in a different state, presumably in Pennsylvania, which is less than 20 miles away. [*]Several older papers listed below appeared in both the 2008 and 2010 Mackinac Center studies but we choose to repeat them here and for two reasons: 1) they represent part of the original literature review we conducted before building our own statistical model and 2) the scale and quality of these works are such that leaving them out would diminish the usefulness of this report. [§]These discarded packages were collected before the most recent cigarette excise tax increases by all three units of government. Cook County raised their excise tax $1.00 in 2013 to $3.00 per pack and the city of Chicago raised its excise tax by 50 cents in 2014. Moreover, Chicago is not the only city within Cook County that imposes a cigarette excise tax. Both Evanston and Cicero impose excise taxes on cigarettes of 50 cents and 16 cents, respectively. “Cook County Department of Revenue Tobacco Tax Ordinance” (Cook County Department of Revenue, 2013), https://perma.cc/6GKP-9HX7; “Cigarette Tax Delinquency Notices” (City of Chicago, March 26, 2014), https://perma.cc/J9CE-7495. [**]Michael Lovenheim, “How Far to the Border? : The Extent and Impact of Cross-Border Casual Cigarette Smuggling,” National Tax Journal LXI, no. 1 (March 2008), https://perma.cc/9HY9-RHWN. Along these lines, a 2014 study titled “Do Higher Tobacco Taxes Reduce Adult Smoking? New Evidence of the Effect of Recent Cigarette Tax Increases on Adult Smoking” in Economic Inquiry last year examines the degree to which recent excise tax increases impact adult smoking rates. The authors found very little evidence that higher tax rates lead to fewer smokers. The likely reason is that taxes are already so high that those who remain smokers have a “strong preferences” for doing so. The authors write: “Considering all the evidence, we conclude that there is insufficient justification for the widespread belief that raising cigarette taxes will significantly reduce cigarette consumption among adults, even young adults.” Kevin Callison and Robert Kaestner, “Do Higher Tobacco Taxes Reduce Adult Smoking? New Evidence of the Effect of Recent Cigarette Tax Increases on Adult Smoking,” Economic Inquiry 52, no. 1 (2014): 157, https://perma.cc/9AKX-FR6Y. [††]Related, a 1995 study by economist R. Morris Coats found that about 80 percent of the “tax effect” on cigarette sales are due to cross-border purchases and the rest from a decline in consumption. R. Morris Coats, “A Note on Estimating Cross-Border Effects of State Cigarette Taxes,” National Tax Journal XLVIII, no. 4 (1995): 573–584, https://perma.cc/LRJ9-GJRY.